1. localized hyperplasia of the horny layer of the epidermis due to pressure or friction. 2. an unorganized network of woven bone formed about the ends of a broken bone; it is absorbed as repair is completed (provisional callus), and ultimately replaced by true bone (definitive callus). 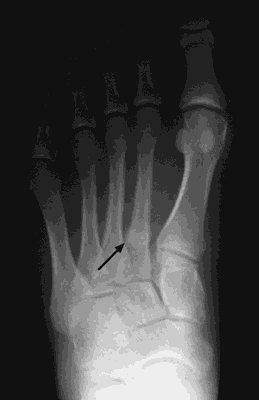 A fracture with callus formation (arrow) is demonstrated corresponding to the base of the second metatarsal. From Thrall and Ziessman, 2001. (kal'ŭs), Avoid substituting the adjective callous for this noun. Avoid substituting the nonword calloused for the past participle callused. 1. localized hyperplasia of the stratum corneum of the epidermis due to pressure or friction. 2. an unorganized network of woven bone formed about the ends of a broken bone, which is absorbed as repair is completed (provisional c.), and ultimately replaced by true bone (definitive c.) . a. A localized thickening and enlargement of the horny layer of the skin. Also called callosity. b. The hard bony tissue that develops around the ends of a fractured bone during healing. To form or develop such hardened tissue. See Usage Note at callous. 1 also called callosity. a common, usually painless thickening of the stratum corneum at locations of external pressure or friction. Compare corn. 2 also called keratoma. Bony deposit formed between and around the broken ends of a fractured bone during healing. callous, adj. Undifferentiated plant tissue produced at wound edge, callus tissue can be grown in vitro and induced to differentiate by varying the ratio of the hormones auxin and cytokinin in the medium. Callosity, tyloma—A focus of hyperkeratotic skin secondary to repeated friction or pressure. A mass of indurated bony trabeculae and cartilage formed by osteoblasts early in healing fractures. A focus of indurated hyperkeratotic skin with a smooth centre, which is usually avascular, caused by rubbing or pressure; typically seen on the plantar aspect beneath the metatarsal head, as well as on the heel and Achilles tendon. Increased intermittent pressure on the skin; abnormal varus or valgus of foot leading to uneven weight distribution; local bone defect (plantar flexed ray, heel spur), long metatarsal, extrinsic pressure (improper footwear); surgical scars or lacerations. Trimming of the hyperkeratosis to the central core, soaking (e.g., epsom salts), and shaved regularly; to redistribute weight-bearing, a full-sole orthotic, footwear change and a metatarsal pad or hammer-toe crest pad if needed. 2. A composite mass of tissue that forms at a fracture site to establish continuity between the bone ends; it is composed initially of uncallused fibrous tissue and cartilage, and ultimately of bone. Salicylic acid or careful shaving will remove the callosity temporarily. Removal is made permanent only by elimination of the cause. The exudate found between two ends of a fractured bone that develops into true bone. A temporary deposit between the ends of a fractured bone that is reabsorbed when true bone develops. 1. A collection of partly calcified tissue, formed in the blood clot around the site of a healing fracture. Callus is readily visible on X-ray and indicates that healing is under way. 2. A skin thickening (see CALLOSITY). a mass of immature plant cells which can differentiate into mature tissues, depending upon the relative concentrations of plant growth hormones present. Callus can develop from EXPLANTS in laboratory tissue culture experiments but also occurs naturally at the end of cut or wounded surfaces of shoots and roots. Thickened skin due to chronic rubbing or irritation. the collagenous tissue which forms around a healing bone at the site of injury. 2. A composite mass of tissue that forms at a fracture site to establish continuity between the bone ends. n the tissue near and about the broken fragments of a bone that becomes involved in the repair of the fracture through various stages of exudate, fibrosis, and new bone formation. 1. localized hyperplasia of the horny layer of the epidermis due to pressure or friction. In dogs, these often form over pressure points such as the elbow, hock and (in some breeds) sternum, particularly if the animal is sleeping on a hard surface. around the outside of a fracture. a form of delayed healing in which fibrocartilage forms between fracture fragments, resulting in a false callus. Called also elephant's foot callus. between the ends of fractured bones. new bone formed by the proliferation of periosteal osteogenic cells. secondary bacterial infection, particularly of pressure point calluses in dogs; can be extensive with deep pyogenic inflammation. the originating fibobrocellular tissue before calcification. may develop over a prominent sternum in some breeds of dogs, particularly Dachshunds, in response to pressure.